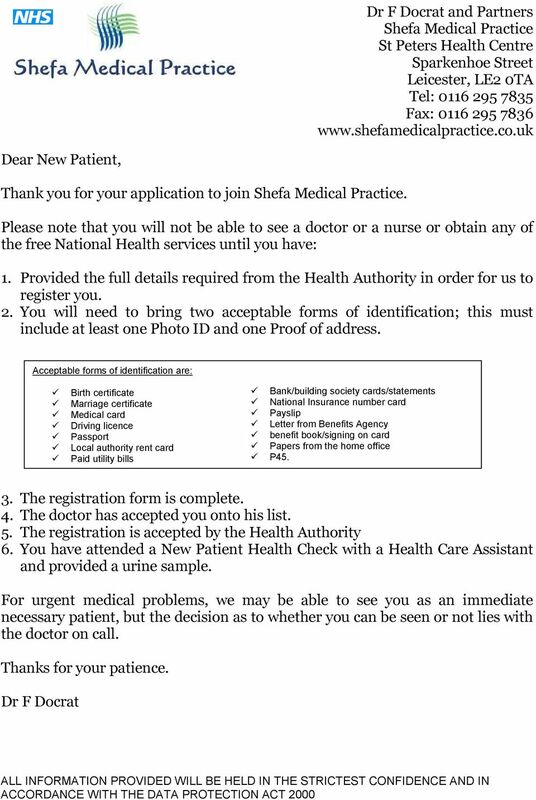 Download "Please note that you will not be able to see a doctor or a nurse or obtain any of the free National Health services until you have:"
2 Dr Docrat & Partners Medical History Questionnaire Name Address NHS Number (You will find this on your Medical Card) Telephone Date of Birth../ / (If Applicable). First Language Preferred Language.... Are you able to speak English? Yes / No Religion Previous Doctors Name Previous Doctors Address... Reason for leaving... Have you been a Resident in the UK for more than 6 months? Yes / No Are you a Carer? (I.e. are you responsible for looking after someone who under normal circumstances would be able to look after themselves) Yes / No DO YOU HAVE ANY OF THE FOLLOWING MEDICAL PROBLEMS? ASTHMA Yes / No Date of Diagnosis... DIABETES Yes / No Date of Diagnosis... HEART PROBLEMS Yes / No Date of Diagnosis... INFECTIOUS DISEASE Yes / No Date of Diagnosis. If you have any other medical problems, please give details. 3 ARE YOU TAKING ANY MEDICATION PRESCRIBED BY YOUR DOCTOR? Yes / No If yes, please give details & bring medications to this appointment Medication Dose How often If you are a female, when was the last date of your last Smear Test? If the Patient is under 5 years old, please give up to date details of Immunisations, you must also bring the child s Red Book to this interview. Are there any other Health Problems/Concerns you wish to inform us? Please provide two items of identification; this must include at least one Photo ID and one Proof of address. See below for a list of acceptable forms of identification. Birth certificate Marriage certificate Medical card Driving licence Passport Local authority rent card Paid utility bills Bank/building society cards/statements National Insurance number card Payslip Letter from Benefits Agency/benefit book/signing on card Papers from the home office P45. IMPORTANT INFORMATION Please return your completed questionnaire to the surgery as soon as possible. If we are in a position to accept you as a patient, you will be offered an appointment at the surgery for a New Patient Health check with our Administrator who will explain our surgery procedures and give you a practice information leaflet. This is so we can record your medical history and more importantly it will give you an opportunity to discuss any health concerns you may have. This whole registration process will take no longer than 1 hour, so please bear in mind if you need to return to work or have other commitments. Thank you for taking the time to complete this questionnaire. 4 Please help us by providing information about your ethnic group Why we are collecting information about your ethnic group. Everyone belongs to an ethnic group, so all our patients are being asked to describe their ethnic group. We are collecting this information to help the NHS and social services to: Understand the needs of patients and service users from different groups and so provide better and more appropriate service for you Identify risk factors some groups are more at risk of specific diseases and care needs, so ethnic group data can help treat patients and support service users by alerting staff to high risk groups Improve public health by making sure that our services are reaching all of our local communities and that we are delivering our services fairly to everyone who needs them Comply with the law as the Race Relations (Amendment) Act 2000 gives public authorities a duty to promote race equality and good race relations, and ethnic monitoring is important in making sure that race discrimination is not taking place. The 16 ethnic groups used are standard categories for collecting ethnic group information. Using these codes will help us to compare information about the groups using our services with information from the census which tells us about our local population. The list of groups is designed to allow most people to identify themselves. The list is not intended to leave out any groups of people, but to keep the collection of ethnic information simple. It is important to us that you are able to describe your own ethnic group. If you need to complete any of the boxes labelled any other group, then please give some details so that we can better understand your needs. You do not have to complete the question but providing this information is very important. It will help us with diagnosis and assessment of your needs, and it will also help us to plan and improve our service. The information you provide will be treated as part of your confidential NHS record. The NHS and social services have strict standards regarding data protection, and your information will be carefully safeguarded. This information will be added to your medical record. If you do not wish to provide this, please tick the Information refused box at the end of the list. Name... Date of Birth Ethnic origin (please tick the description which you feel is most appropriate) White - British White - Irish Other White background Mixed White and Black Caribbean Mixed White and Black African Mixed White and Asian Other mixed background Asian or Asian British - Indian Asian or Asian British - Pakistani Asian or Asian British - Bangadeshi Other Asian background Black or Black British - Caribbean Black or Black British - African Other Black background Chinese Other ethnic background Information refused If you have any concerns or questions regarding this request, or you want to make any comments or complaints about the collection of this information, or the way in which you have been treated by staff requesting this information, please contact the practice manager. 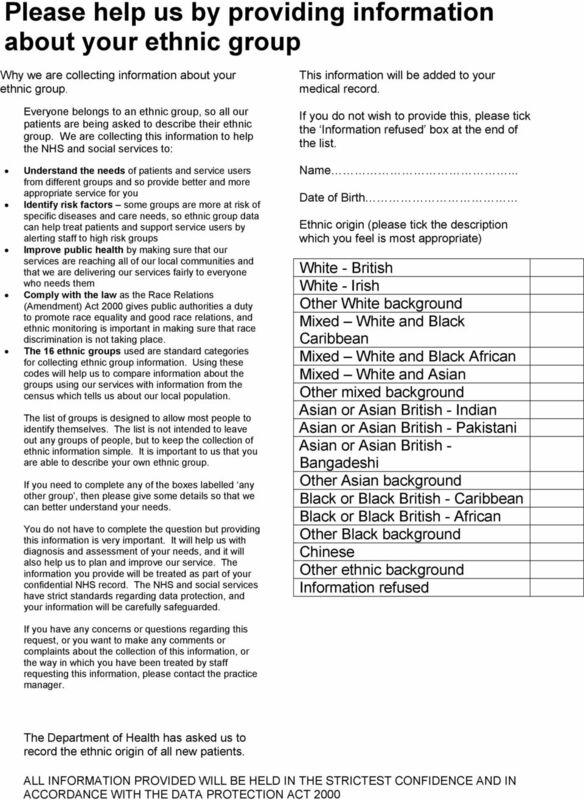 The Department of Health has asked us to record the ethnic origin of all new patients. 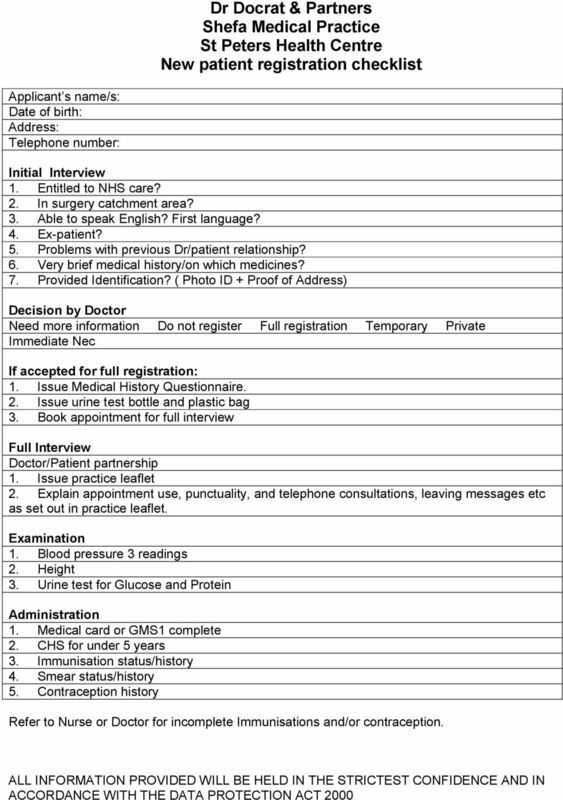 5 Dr Docrat & Partners New patient registration checklist Applicant s name/s: Date of birth: Address: Telephone number: Initial Interview 1. Entitled to NHS care? 2. In surgery catchment area? 3. Able to speak English? First language? 4. Ex-patient? 5. Problems with previous Dr/patient relationship? 6. Very brief medical history/on which medicines? 7. Provided Identification? ( Photo ID + Proof of Address) Decision by Doctor Need more information Do not register Full registration Temporary Private Immediate Nec If accepted for full registration: 1. 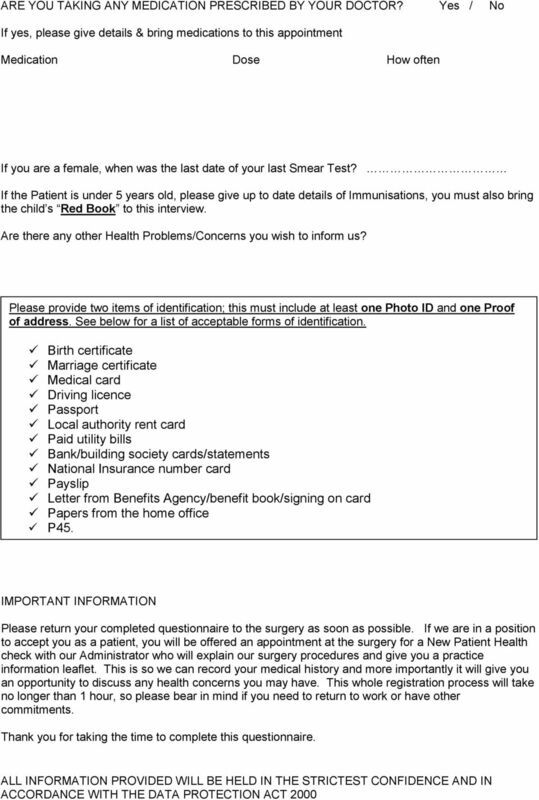 Issue Medical History Questionnaire. 2. Issue urine test bottle and plastic bag 3. Book appointment for full interview Full Interview Doctor/Patient partnership 1. Issue practice leaflet 2. Explain appointment use, punctuality, and telephone consultations, leaving messages etc as set out in practice leaflet. Examination 1. Blood pressure 3 readings 2. Height 3. Urine test for Glucose and Protein Administration 1. Medical card or GMS1 complete 2. CHS for under 5 years 3. Immunisation status/history 4. Smear status/history 5. Contraception history Refer to Nurse or Doctor for incomplete Immunisations and/or contraception. Please make an appointment with the nurse for a new patient medical within one month of joining the practice. 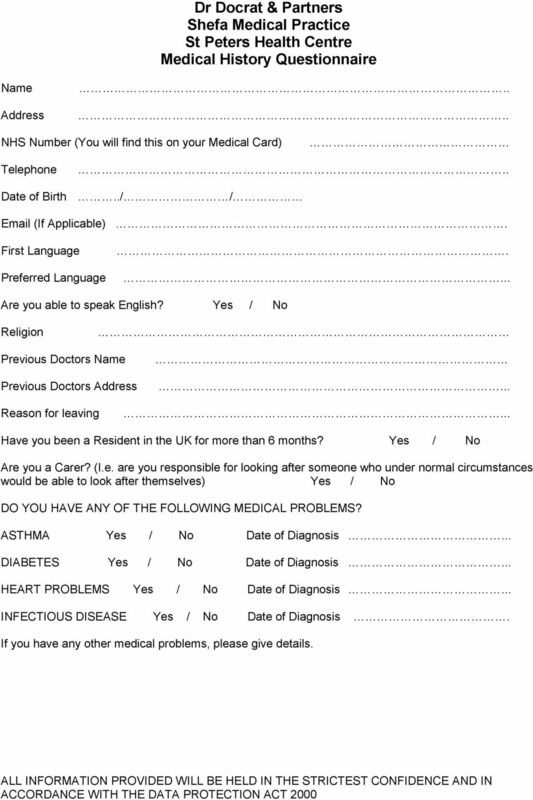 MILLRISE MEDICAL PRACTICE NEW PATIENT REGISTRATION/HEALTH QUESTIONNAIRE PLEASE COMPLETE THIS FORM IN BLOCK CAPITALS. To register with the Practice please complete this questionnaire as fully as possible. Your GP will be: APPLICATION FOR GENERAL MEDICAL SERVICES WITH THE CHARTER MEDICAL CENTRE Dr From AUG 2015 PLEASE COMPLETE THIS FORM IN CAPITAL LETTERS Have you been registered at this practice before? And finally please do not forget to SIGN the form at the bottom front. Degree Application Form 2015/16 BCME collects information about you on this form to ensure that we are fully prepared to offer you the best experience. Please complete it clearly, in black ink if possible. Ref no. office use only: Post applied for: Location: Before completing this form please carefully read the accompanying guidance notes and job description. You can return the form by email or by post. Application form Please complete all sections of this form using dark ink. We do not accept curriculum vitae in place of completed application forms.